The three-cent piece composed of 75% copper and 25% nickel, but of a silvery appearance, was authorized by the Act of March 3, 1865. It was designed to take the place of silver-alloy three-cent pieces (made since 1851, but in greatly reduced numbers after 1862) and to provide an alternative to three-cent paper fractional currency notes. The design, featuring a Liberty head with a tiara on the obverse and Roman numeral III within a wreath on the reverse, was the work of James B. Longacre. The reverse depicts a laurel wreath and was no doubt inspired by Longacre's 1859 Indian cent reverse. As a general rule, most extant nickel three-cent pieces show wear and are dated from 1865 through 1876. The earlier dates are the most plentiful, in keeping with their higher mintages. Mint state coins are most often seen for early dates, especially 1865 and 1866, to a lesser extent 1867-1870, and also 1881, 1888, and 1889. Nearly all Mint State coins show signs of light striking. This is particularly true of dates in the 1865-1876 era. For some reason, pieces dated 1881, 1888, and 1889 are usually sharp. Proofs were struck of all dates 1865-1889, including the 1887/6 overdate. The rarest Proof date is 1865 (which is an interesting footnote, as this date is the commonest in Mint State). Proofs of the 1865-1876 dates are, as a class, quite scarce. In their time, these coins were not appreciated by numismatists, and it is my guess that many were "spent." However, as each of these early dates has a generous mintage for circulation, and is not considered to be a key issue, the price of Proofs is not particularly high. Nickel three-cent pieces of the 1877 and 1878 years were minted only in Proof finish; none was made for circulation. Collectors recognized a rare issue when they saw it, and beginning in 1877, numismatists saved Proofs in large numbers. The mintage of the 1877 Proof is not known, and estimates have ranged from 510 (which is the mintage for certain 1877 silver coins; some have assumed that a like number of nickel three-cent pieces saw production) to a couple of thousand. I believe that the number is somewhere between 1,000 and 2,000. It is almost a given that in any particular year, many more Proof minor coins (denominations struck in bronze or nickel alloy) were struck than were Proofs of the silver denominations. Mint records for Proof minor coins prior to 1878 do not survive, and today any published mintage figures are guesswork (sometimes educated, sometimes not). In 1878, according to Mint records, 2,350 nickel three-cent pieces were struck, all Proofs. These are highly prized for their Proof-only status. Proofs from 1879 through 1889 were struck in fairly large numbers, with the lowest mintage being 1887 (2,960 pieces; more about this date later). As a result, all are readily available today. 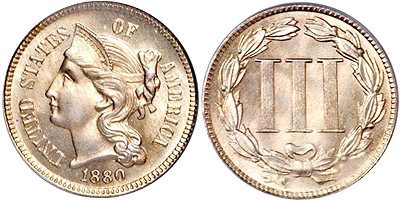 The 1886 was struck only with Proof finish; that is, no related business strikes were produced of this date. The mintage was 4,290 coins. From 1879 to 1889, with the exception of 1881 (in particular) and 1888 and 1889, not many business strikes were produced. Thus, these dates have overall low mintages. Today, Proofs are much more often encountered than business strikes. True Mint State coins are great rarities. However, it is probably true that in your lifetime you will never known how rare they are. That is because many Proofs were struck with somewhat frosty fields, sort of a hybrid between a Proof and a business strike. Numerous of these semi-frosty Proofs have been certified as Mint State by the grading services. Thus, Mint State coins appear to be much more available than they really are, if you look at the grading service Population Reports. In 1887, the mintage of Proofs was 2,960 pieces, which was, as noted, the smallest figure of any Proof nickel three-cent piece of its era. This number includes two varieties: the 1887 regular date and the 1887/6 overdate. It has been my experience that the regular dates are about twice as rare as the overdates. Thus, the original Proof mintage was probably about 1,000 regular dates and 2,000 overdates.